It was very muggy today with a hint of rain in the air. After lunch the sheep in the adjacent meadow started to lay down and shortly after there was a brief shower. The adjustable shelves are now in the upper pantry. All it now needs is a front cupboard door and some ducting to conceal and protect the cable to the light switch. 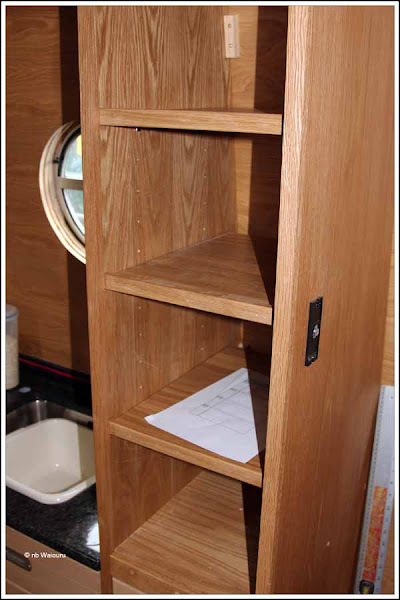 Jan has already started to fill the galley cupboards and drawers in preparation for our move aboard on Friday. Meanwhile I spent all of the day working on the wiring. I made a start on the stern node after fitting the midships GSM node. It has been mounted high on the rear port (left) wall adjacent to the cockpit bulkhead. It will eventually be enclosed in a high level cupboard above the bed. There is a 3” void across the rear bulkhead so all the cabling will be hidden. 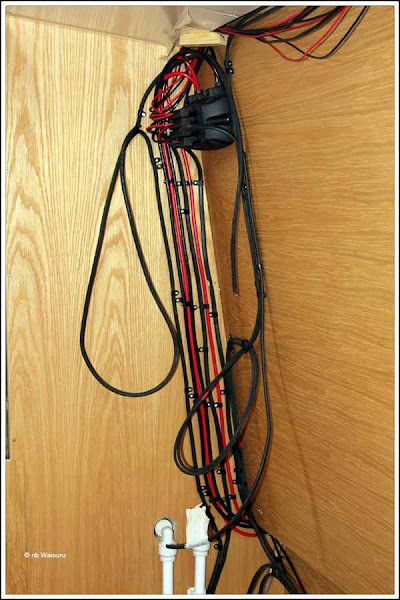 The two large loops of cable are for the connection to the future solar panel controller and the 8 membrane switch. As you can see the node currently doesn’t have many input and output connections. 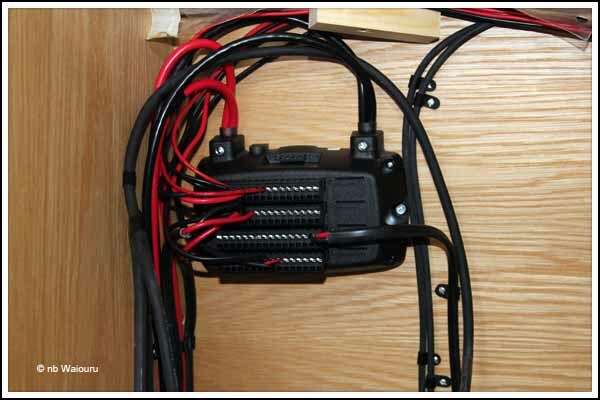 All the wiring to the engine compartment has to be installed along with devices such as the rear PIR detector. However the important connections to the fridge and freezer have been made. The +/- cables to the battery bank have been run and the node connections made. The planned 3” void across the back of the boat has enabled me to run the starboard wiring across to the stern node. The blue cables are the 240v AC lines for the calorifier immersion heater and the starboard ring main to the plugs on that side of the boat. The pair of vertical blue cables are for a 240v plug which will be mounted high on the face of the starboard wet locker. The wiring to the GSM node and the canbus connections between the midships and stern nodes are outstanding along with the temporary connection to the battery bank and the connections to the two 8 switch membranes. 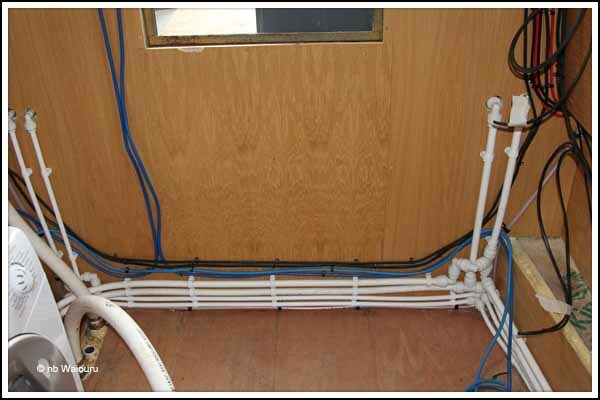 The water pump needs to be installed and the water connections for the vanity, sink, and shower have to be made. Time is ticking away! The noisy green thing is out of its box!